The IAA attracted 931,700 visitors in 2015. It had 1,103 exhibitors from 39 countries. 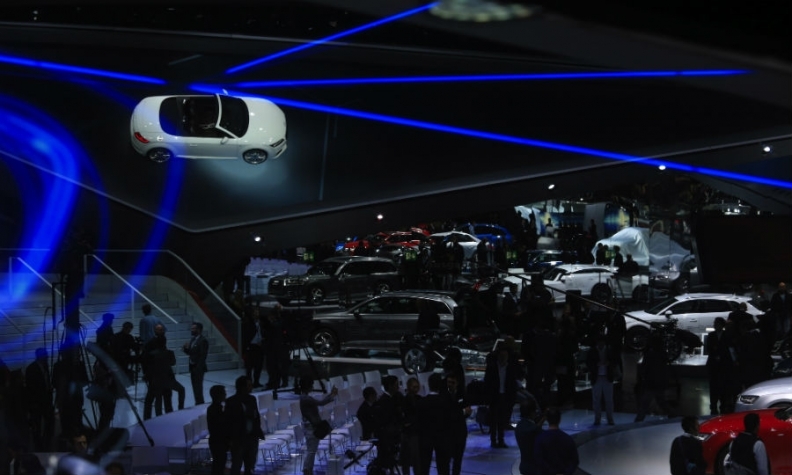 FRANKFURT -- One of the world's biggest auto shows in Frankfurt, Germany, will be missing at least nine brands this year as the trend for automakers to shift their marketing spending into new areas such as the Web and social media gathers pace. Brands skipping Frankfurt's IAA exhibition in September include two PSA Group brands, Peugeot and DS, and three Fiat Chrysler Automobiles units, Fiat, Alfa Romeo, Jeep, as well as Nissan and its Infiniti luxury marque. The IAA organizers, Germany's VDA industry association, confirmed that some automakers have cancelled their participation without giving names but said more than 50 brands from Europe, the U.S. and Asia would be attending. These will include "young Asian manufacturers," which will be at the show for the first time, along with major international tech companies such as Qualcomm, Sony, IBM. "Naturally we regret when individual exhibitors will not be in Frankfurt this time. The reasons are varying and each specific to the company, but mainly connected to financial or corporate policies," VDA managing director Klaus Braeunig said in the statement. "These exhibitors however have all spoken out in favor of strong automotive trade shows and are open to returning in the future." A PSA spokesman said it is considering the return on investment and will not take part in shows out of "habit." "Each brand constantly compares the efficiency of its marketing investments to decide its participation in shows," the spokesman said. Citroen will be at Frankfurt to support a product launch, he said. Peugeot and DS have decided to communicate to their respective customers through other marketing methods. Nissan said its decision to skip the IAA followed a global review of the company's event and show strategy. "Moving forward, we will adopt a flexible strategy using a combination of automotive, consumer and dedicated Nissan events and partnerships to broaden our reach and appeal among influencers and wider consumers," a Nissan Europe spokesperson said. FCA declined to comment but sources said the automaker will not have a presence at the show. Mitsubishi and Volvo also will not be present, according to Automobilwoche, a sister publication of Automotive News Europe. The IAA is held every two years, alternating with the Paris show. In 2015, the 11-day event had 1,103 exhibitors from 39 countries and attracted 931,700 visitors, 50,000 more than the previous show, according to the VDA. In the past, auto shows were a perfect opportunity for customers to cross-shop various models at one time, as a wide range of brands all showcased their latest product range within a relatively small proximity to each other. Now that most car buyers research their potential purchases online, where prices are transparent, the importance of many shows in purchasing decisions is declining. At the same time, more and more automakers, faced with spiraling development costs for zero-emission technologies and autonomous driving, are reducing non-critical expenditure and questioning whether the benefit of a trade show presence outweighs the considerable costs. Organizers of the Leipzig trade fair, the German import brand association VDIK, confirmed that they did not expect to hold the event again after cancelling the show last year for the first time. Ford Motor and Rolls-Royce were among companies that skipped the Paris show last year.